Thallus: squamulose, arising among areoles of host Caloplaca, forming eventually orbicular, subeffigurate, independent thalli 1-2 cm wide within disintegrated portions of the host squamules: 0.4-2 mm across, up to 1 mm thick, imbricate or crowded; rim: often down-turned upper surface: yellow, often partially white pruinose, dull, convex, rough, fissured, rugulose to undulate upper cortex: paraplectenchymatous, 30-50 µm thick; syncortex: usually lacking; eucortex: often completely dull yellow throughout, but sometimes with a lower hyaline layer algal layer: dense, thick beneath apothecium, even medulla: white, prosoplectenchymatous lower surface: white, ecorticate attachment: narrow, forming stipes less than half of diam. of the squamules Apothecia: 1-6 per squamule, immersed, but usually only one prominent, often expanding to 1 mm, reducing thallus to margin disc: dark blackish to reddish brown, plane, rough parathecium: indistinct epihymenium: yellowish brown to reddish brown, conglutinated, 15-30 µm thick hymenium: hyaline, 100-130 µm tall; paraphyses: 1-1.8 µm wide at base, apices barely expanded, spreading in water subhymenium: hyaline, obscure, with dense underlying algal layer; hypothecium: indistinct asci: narrowly clavate, 70-100 x 18-20 µm, 100+-spored ascospores: hyaline, simple, usually globose or broadly ellipsoid but occasionally narrower, 3-4 x 2-3 µm, with distinct mucilage layer or perispore Pycnidia: not seen Spot tests: UV+ orange, all spot tests negative Secondary metabolite: rhizocarpic acid. Ecology and substrate: believed to favor calcareous rocks or microhabitats, parasitic on Caloplaca trachyphylla in western North America World distribution: Iran, Turkey, Afghanistan, and western North America Sonoran distribution: northern Arizona. Notes: Acarospora stapfiana grows primarily within the areoles of Caloplaca trachyphylla and is almost as common as its host, which occurs from Arizona to southern Canada. Eventually A. stapfiana becomes independent of Caloplaca. 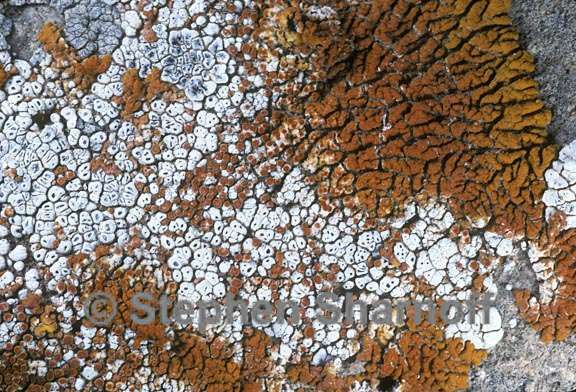 In this state, it may be mistaken for A. socialis, that grows among (but not in) many different lichens. In the latter case, the major difference is that A. stapfiana has more broadly ellipsoid or globose spores and overall has smaller squamules. Acarospora brouardii is probably parasitic on Caloplaca species also but has larger squamules with black corticate undersides. All three species have stipes.